Door 16: On this Day….The Day the New Madrid Earthquakes struck! For the final installment of the #OnThisDay posts we’re going to Missouri to look at the day the Mississippi River flowed backwards! 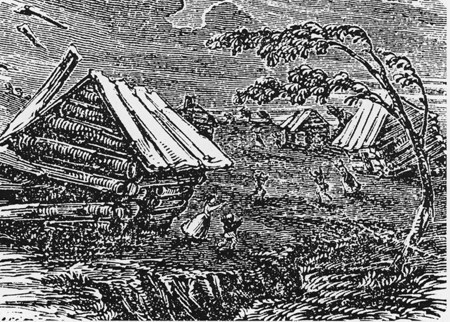 On this day in 1811, a series of intense intraplate earthquakes hit the Mississippi river town of New Madrid, Missouri in the United States. This series of quakes, to this day, are still the most powerful earthquakes to hit the eastern United States in recorded history. 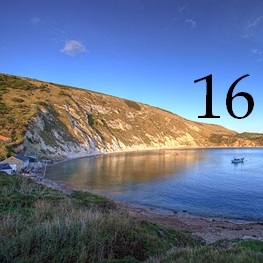 December 16th marked the first in a series of 4 powerful quakes which ended on the 7th February, 1812. Drawing of New Madrid Earthquake. Image Credit – USGS, Wikimedia Commons. the region of 7.2-8.1. It caused minimum damage, mostly because the area was very sparsely populated, however the village of Little Prairie, on the site of modern-day Caruthersville, was severely damaged due to soil liquefaction. The second quake hit on the same day at 7:15am, of a similar magnitude and intensity. The tremors caused the nearby Mississippi River to ‘flow backwards’ through the formation of a ‘seismic seiche‘. This was particularly evident in the final quake on the 7th February when the river is recorded as having flowed backwards for ‘several hours’. According to records the seismicity caused the Mississippi River to ‘rise like a great loaf of bread‘ with waves from the vibrations appearing to show the river running north. On the 16th of December, 1811, about two o’clock, a.m., we were visited by a violent shock of an earthquake, accompanied by a very awful noise resembling loud but distant thunder, but more hoarse and vibrating, which was followed in a few minutes by the complete saturation of the atmosphere, with sulphurious vapor, causing total darkness. The screams of the affrighted inhabitants running to and fro, not knowing where to go, or what to do—the cries of the fowls and beasts of every species—the cracking of trees falling, and the roaring of the Mississippi— the current of which was retrograde for a few minutes, owing as is supposed, to an irruption in its bed— formed a scene truly horrible. This is just one of many eyewitness accounts that were recorded from French Creoles, Native Americans and pioneers who lived in the area. They describe scenes of the land undulating, chasms opening and swallowing cattle whole, smoke and sand obscuring the sun and the riverbed rising so high that parts of the river ran backwards. This also isn’t the only time that the Mississippi River has been driven backwards, a similar thing happened when Hurricane Isaac hit in 2012, this was caused by the strong winds and waves created by the force of the Hurricane. Geology of the Reelfoot Rift. Image Credit – USGS, Wikimedia Commons. 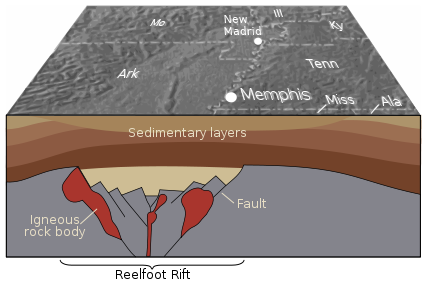 The tectonics behind the New Madrid earthquake is still not well understood but appears to relate to an old geological feature beneath the Mississippi river alluvial plain, often called the ‘Reelfoot Rift’. The area known as the ‘New Madrid Seismic Zone’ is made up of a series of reactivated faults that formed during the breakup of the Rodinian supercontinent, around 750 million years ago. Faults were created as part of an ultimately failed rifting system but the weakness has remained deep underground. Minor earthquakes have been occurring at this site since around 1974 and forecasts suggest there is a 7-10% chance there will be a repeat earthquake of a similar intensity in the next 50 years. 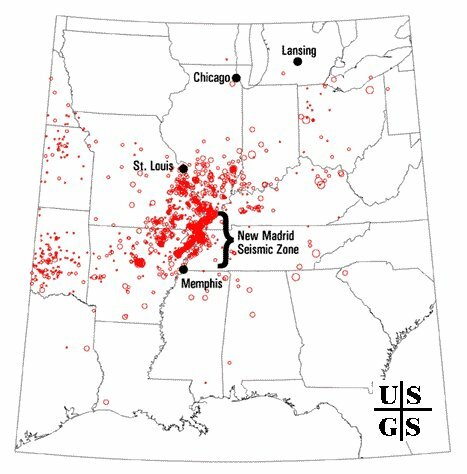 Map of the New Madrid Seismic Zone, New Madrid County, Missouri. There have been 4000 recorded earthquakes in the area since 1974. Image Credit – USGS, Wikimedia Commons. A report filed by the US Federal Emergency Management Agency in 2008 stated that another earthquake in this area could cause ‘the highest economic losses due to a natural disaster in the United States’. Tags: advent calendar, earthquake, geology, hazards, history, Mississippi, New Madrid, on this day. Bookmark the permalink.